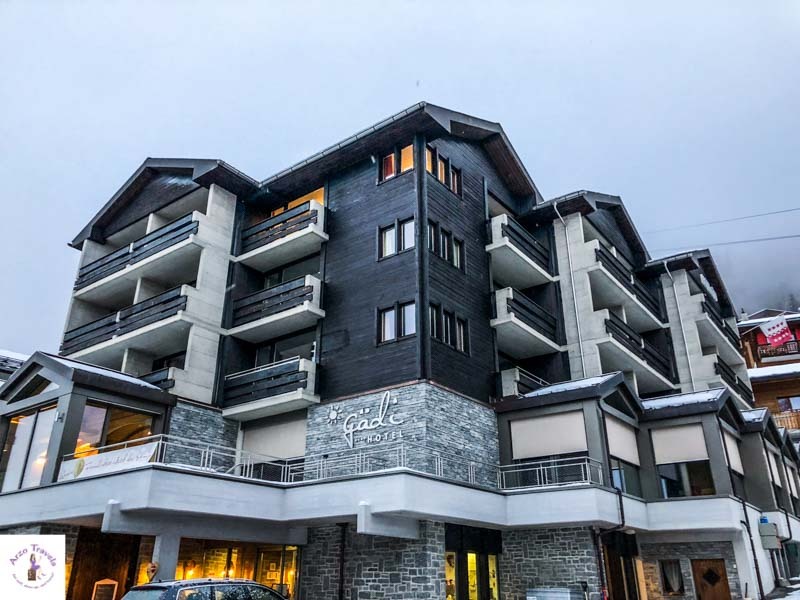 Are you looking for the perfect family ski destination in Switzerland? Then Grächen is the place for you. 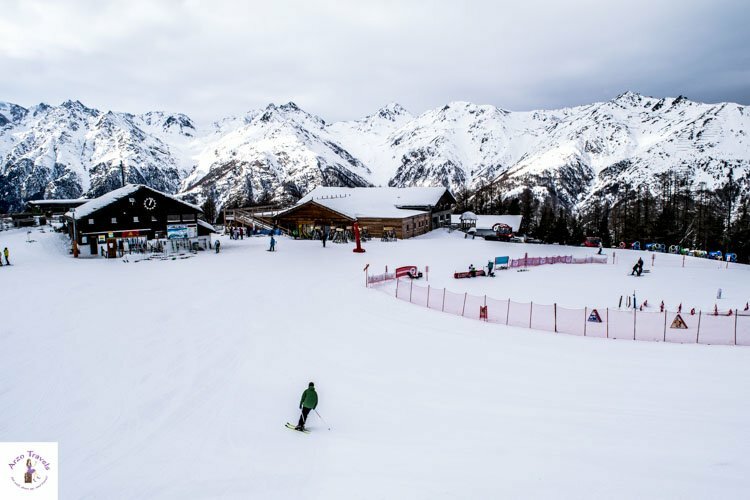 Grächen is the perfect family ski resort in Europe – whether you have younger kids (up to twelve years, I would say) or are a senior who prefers a more relaxed place to do winter sports, Grächen was voted the best ski destination in Europe, and thus, might be the perfect choice for you! I visited Grächen (1619 meters above sea level) this January after staying in Verbier for a few days. Grächen is a winter wonderland but definitely attracts a different audience. Nine kilometers of the 44km of prepared slopes are easy, 33km are moderately difficult, and 2km are difficult, so Grächen is not a very big ski paradise. 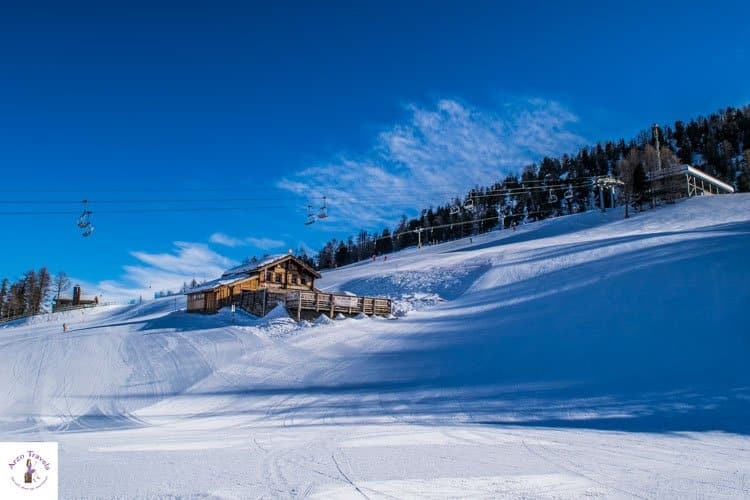 But it is perfect for beginners and families, where more experienced skiers can enjoy the more difficult slopes while the beginners ski the easier ones. 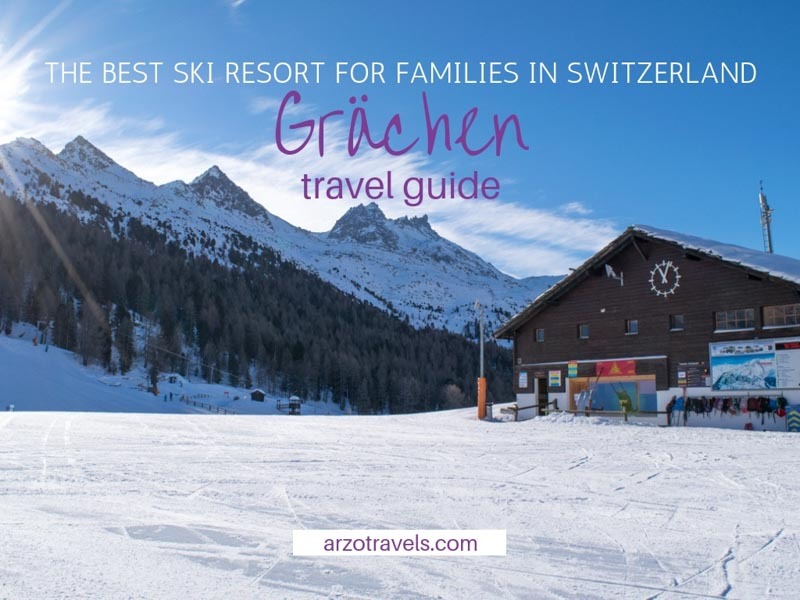 It is the perfect place for a family skiing trip in Switzerland – and in this post, you will find out what to do in Grächen in the winter (and what makes Grächen such a fun winter destination), where to stay, and more important travel tips. 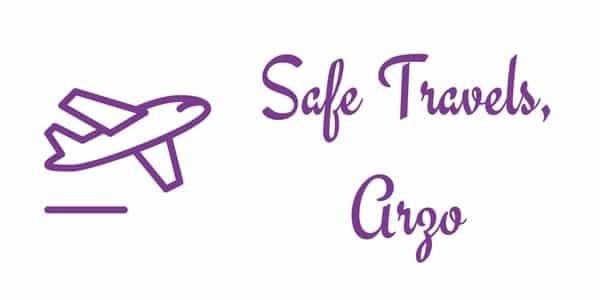 Here are some important travel tips for Grächen so that you can plan your trip more easily. Grächen is located in Valais (Wallis) in the south of Switzerland, about an hour‘s drive from the famous ski destination of Zermatt. 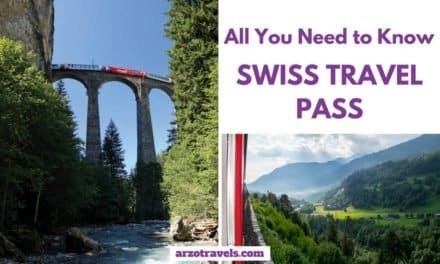 The best way to arrive is by taking a train to St. Niklaus train station (public transportation in Switzerland is super convenient, fun, and reliable) and then taking a yellow bus (Postauto) to Grächen – Post station. I recommend checking your connections beforehand. With the right connection, you will only have to wait a few minutes at the train/bus station in St. Niklaus. Grächen is very small and you can walk to many places on foot. There are yellow buses (Postautos) that you can use if you‘d like to explore the area. To get up the mountains you have the ski lifts and cable cars (a bit more on the special cable cars a bit later in this post). I stayed at a great hotel – Hotel Gädi. It was voted the friendliest, small, hotel in Switzerland and it truly is a wonderful place to stay. It is located next to the cable car station, and offers nice views, a little spa area, and… is run by a really, really friendly family. This 3-star hotel is also one of the most expensive in Grächen, but surely well worth the money. As you might know, I don’t always have a “where to eat” section because often, the food I have on my travels, are not really worth being mentioned. BUT…On top of being a great hotel, the food at the restaurant of Hotel Gädi is amazing. I dined in the restaurant twice, and as a vegetarian, I had to make some adjustments to the food (you know, in Switzerland, it is all about the meat). But the vegetarian food was just amazing – and I am sure, if you opt for the non-vegetarian dishes, you will be as happy as I was. In general, I felt like the food was a highlight in Grächen – even lunch at the mountain restaurant on Hannigalp was good. So, I think it is safe to say that I had some of the best food in Switzerland in little Grächen. I am still working on my winter/skiing packing list. In case you forget something, you can easily rent some ski equipment in one of the rental shops in Grächen. Grächen has some small supermarkets/drugstores, so you can buy basic things from there, but in general, I recommend having all your necessities packed. Don’t rely on shopping opportunities there. The winter season in Grächen starts in the middle of December and lasts until about April. During the holiday season (Christmas and New Year’s), it gets busy. The same goes for the school holidays (and carnival) in Switzerland (end of February to the beginning of March). A good, less busy, time to visit Grächen is between January and February, and then again from the middle/end of March until early April. The slopes are not too busy at these times and everything is really relaxed and easy-going. You can get good packages for either 2, 3, or 7 days in Grächen. If you get a 7-day Ski Pass for Grächen, you can even use the pass for one day of skiing in Zermatt. Disclaimer: I was invited to discover Grächen by Valais/Wallis Promotion and My Switzerland, but as always views and opinions are my own. 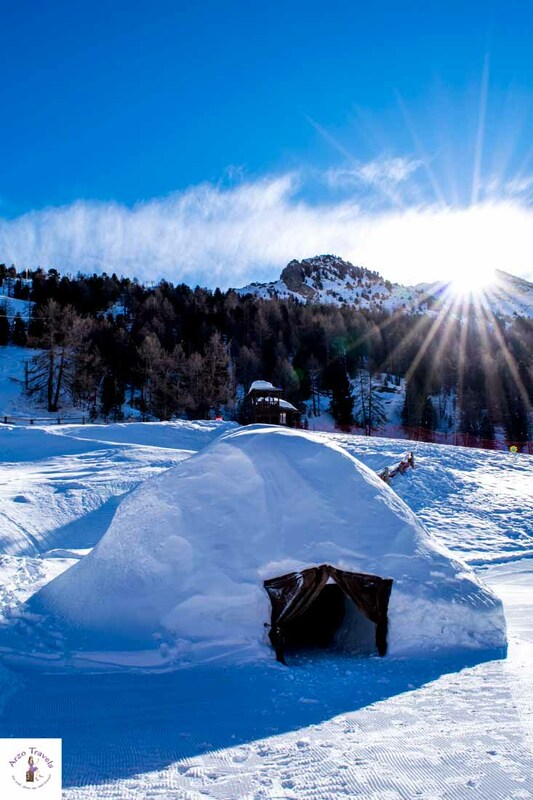 Okay, let´s start with the activities that aren’t the most apparent in a ski resort. Let´s talk about the best things to do in Grächen for non-skiers. As mentioned, the village is small, but holds some interesting history. Doing a guided tour of the village is a good way to learn more about the history of Grächen. The Tourism Office is located next to the church – so if you have any further questions just pop in there. 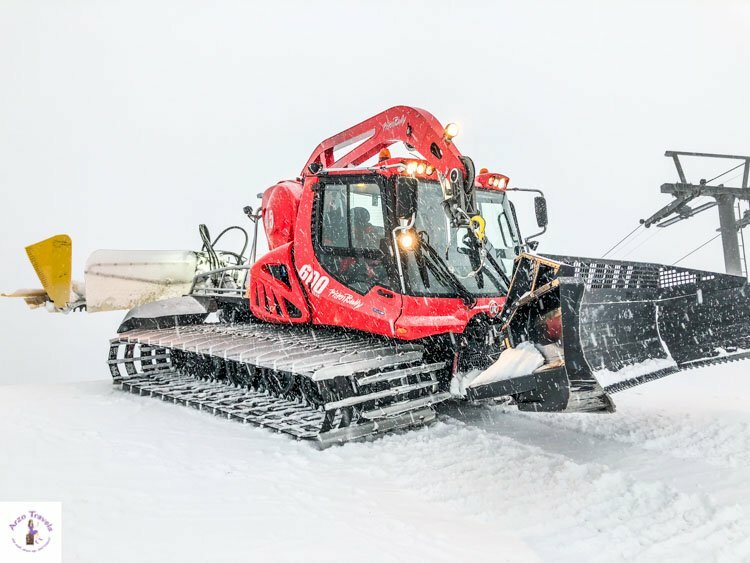 You might have seen those giant bullies that clean the slopes after busy ski times. In Grächen, you can book a tour and enjoy the experience as well. After the slopes close (around 5 pm), you can watch the slopes getting cleaned while enjoying a different kind of ride. While it is very popular with the kids (and the fathers), I admit that I, too, enjoyed it a lot. So, it is not only for the little ones, and it is nice to enjoy a different kind of fun winter activity. Whether you ski or not, getting up on Hannigalp Mountain is a must when in Grächen. At about 2110 meters above sea level, you have lovely views (on a clear day, you can even spot the famous Matterhorn Mountain from here). And here is where the party is – okay, a party with lots of kids, but this is where the action takes place. You have the family park and a restaurant here. The mountain restaurant also serves good food, though vegetarian options are limited (as in most Swiss villages and towns), but the food that was vegetarian was quite good. To have a drink with a view, hike up to Stafelbar and enjoy a drink while gazing out over the mountain. 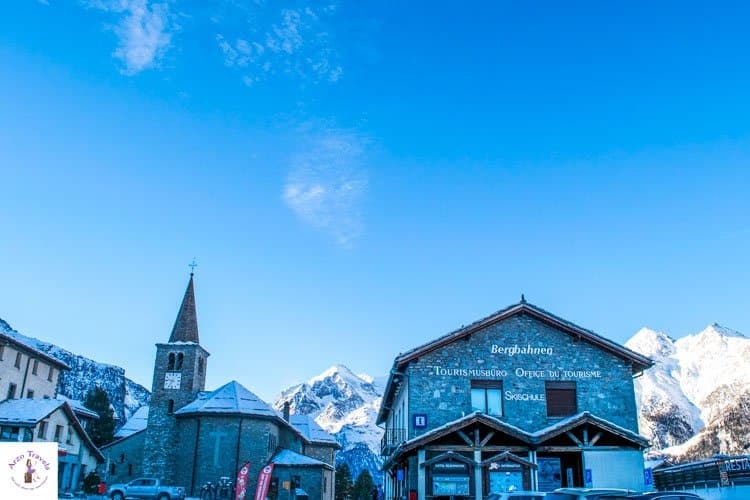 This is a fun, open-air (and indoor places also available) bar with nice views on clear days and a perfect spot to enjoy your apres-ski. Grächen is a wonderful place to go snowshoe hiking on easier trails – hiking from Hanngialp to Staffelbar is one of these nice and easy hikes. For that trail, there is no need to wear snowshoes or carry poles. I was just wearing my insulated, waterproof hiking boots when I went (is it still considered snowshoe hiking then?) You can also choose more challenging trails where you can wear your fun snowshoes and try a different kind of winter sport in Grächen. Check out my favorite images from my “Switzerland in the winter” trip. As someone who has just taken her first skiing lessons, I am not ready to go snowboarding yet. But, you know, wherever there are skiers, there are snowboarders. And Grächen is a little paradise for snowboarders who want to take it easy, while still having more difficult slopes to enjoy. Okay, how could it be any different?! Of course, skiing is also very popular in Grächen. 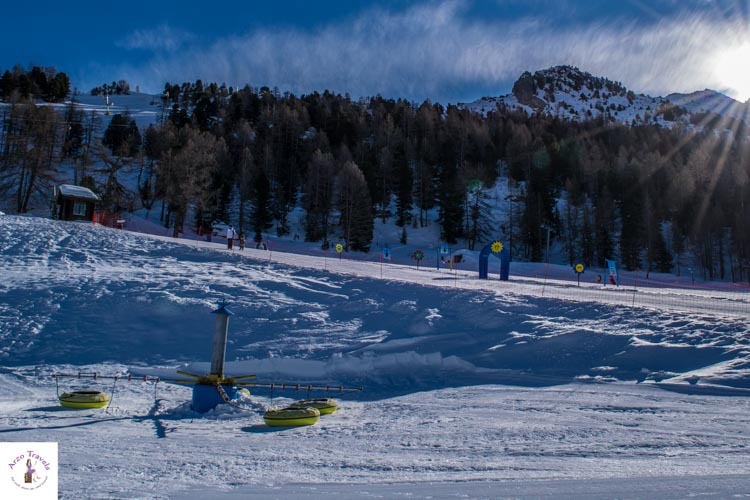 As mentioned at the beginning, there are 44km of prepared slopes – 9km are supposed to be easy, 33 km moderately difficult, and 2 km difficult. 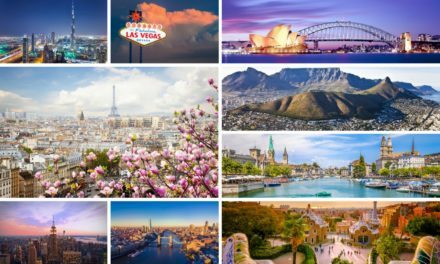 So, there is something for everyone! If you are with your family, send the kids to the skiing school and hit the slopes! There are a few more things to experience at Grächen – like apres-ski, races, a mulled-wine party, snowbiking etc. but those activities do not take place daily, so for extra activities, you need to plan in advance. Speaking of children, here are the best activities and things to do with children. I actually did not visit Grächen with children; I went by myself. 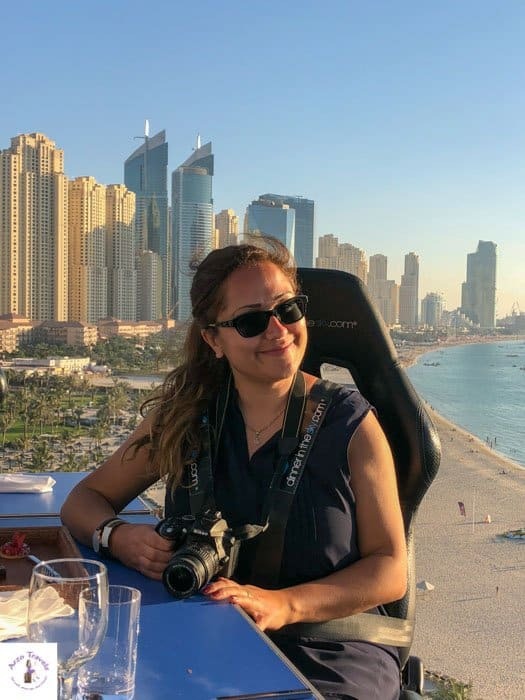 However, since I have a few nephews who I have started traveling with and work as a middle-school teacher, I believe I have a good idea what kids like and what is suitable for kids and teenagers. Grächen with kids seems like a great choice. So, here are a few activities you can enjoy with your children in Grächen. Grächen is probably not the best choice if you only have teenagers (unless they are winter sports beginners), but with younger kids, it is a great place. There are a few activities just for kids (so, it is no surprise that Grächen is the best family ski destination in Switzerland). Getting up Hannigalp via a fairytale gondola is a good start. 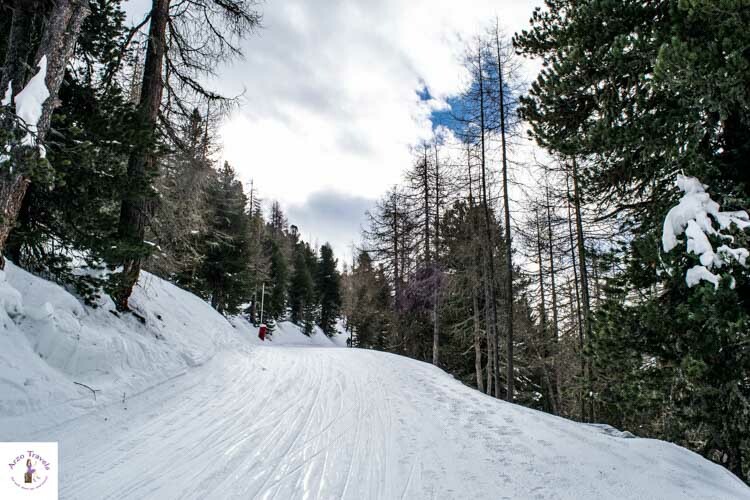 On your way up to Hannigalp Mountain, your kids can hop on a special gondola and listen to a fairy tale. The ride takes about 10 minutes. There are 10 gondolas, each playing a different fairy tale (you will know beforehand which gondola plays which fairy tale). Unfortunately, the fairy tales are only told in German (so, it is also a great way to practice your or your kids‘ language skills). The Children´s Park, at Hannigalp Mountain, offers many different activities for people of all ages. It is over 50,000 square meters. Wolkenland: When it is time to warm up and spend some time indoors, the kids have a free indoor park to release their energy, enjoy sun parcours and cloud climbing walls, and more. The indoor playground is free and adults can either watch their kids or even better, have a drink upstairs in the restaurant. Tubing: Snowtubing is fun. I would not suggest it for the very little ones, but once the kids are older, they can hop on a tire and speed down the hill. And the best part: It is not only for the little ones. Older ones (a.k.a. people like me) will also enjoy this ride, which isn’t extremely scary, but a nice thrill. Prices for renting tubes start from about $5 (for half an hour). Cinema: No matter where kids are, most of them enjoy watching movies. And here at the children’s fun park, kids can watch some movies in an igloo cinema. And it looked as cute as it sounds. Skiing: Oh, how cute is this! The little ones who can barely walk can rock the slopes! 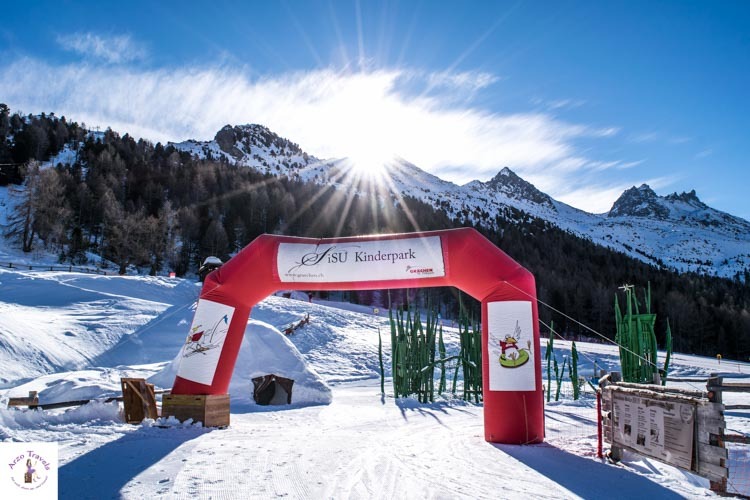 In Grächen, you have the chance to send your kids to skiing lessons from the age of 2-3 age on up. 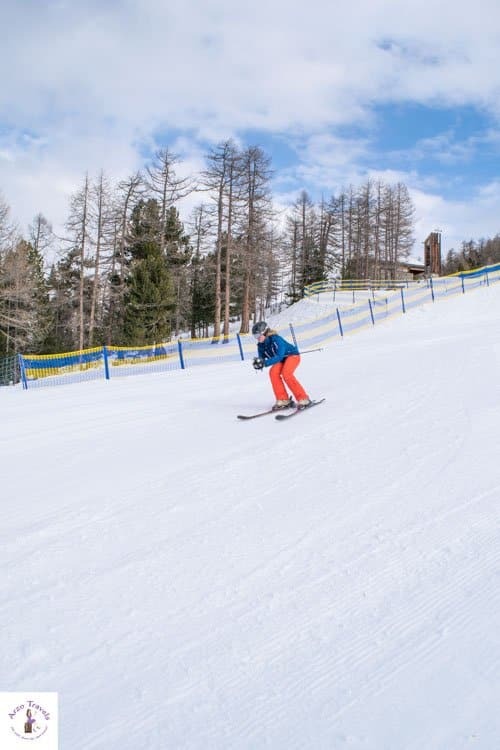 Four magic carpets, two children’s ski lifts, and the nursery slopes make Grächen pretty perfect for their first attempts at skiing (or in the snow, in general). Here are more things to do for the little ones – since don’t take place daily, please check times and prices ahead of time. This list isn’t complete but includes some of the main attractions in Grächen. Unfortunately, this activity is only for the kids. I would have signed up if I had been allowed and I am sure I am not the only adult who would be up for this, right!? I am sure all kids love eating pizza, so why not making their own under supervision? The supervisor is also super nice (I met her, and I am sure the kids will have fun with her), and ideally, the pizza tastes great, too. Let your kids play treasure hunter. Under supervision, they can hunt for the Grächen treasure. If your kids enjoy some competition and like to challenge themselves, let them take part in a children’s race. 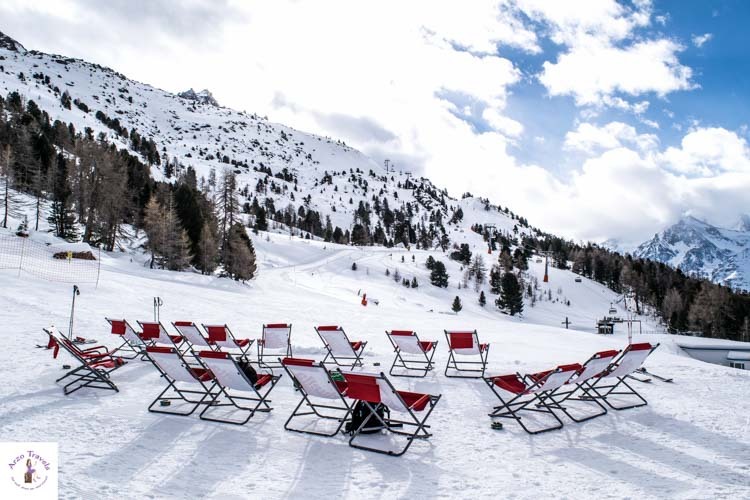 Who says that apres-ski is only for adults? In Grächen, children have their own apres-ski time. As you can see, Grächen is all about a ski trip for the family. 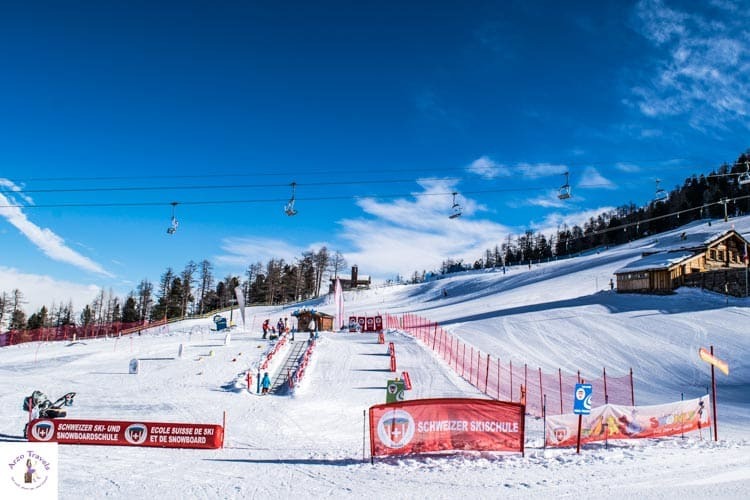 So, if you are wondering about the best ski resort for families in Europe – Grächen is it!